iPhone 8 Price, Review, Deals, Cost, & Sales! Home / Compare Cell Phones / iPhone 8 Price, Review, Deals, Cost, & Sales! 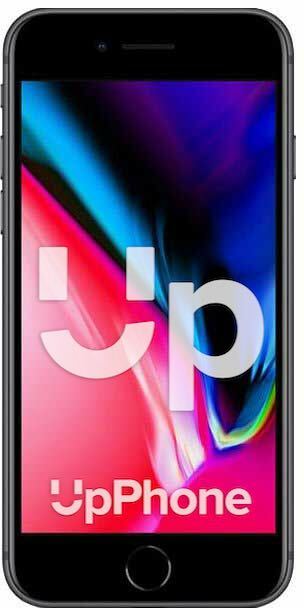 With a more powerful CPU and larger storage capacity options, Apple’s iPhone 8 is essentially a more powerful version of the iPhone 7.
iPhone 8 has a beautiful Retina HD display, with built-in P3 wide color and True Tone. This iPhone’s oleophobic coating will help prevent it from getting covered in fingerprint smudges! Like the iPhone 6s and iPhone 7 before it, the iPhone 8 has a 12 megapixel camera. This camera supports up to 5x digital zoom and can record up to 4K quality video at 24, 30, or 60 frames per second. Just like the iPhone X, the iPhone 8 has 64GB and 256GB storage capacity options. With this much storage space, you can save plenty of videos and pictures as well as download all of your favorite apps! The iPhone 8 has dual stereo speakers which provide amazing sound quality. The stereo speakers are located at the bottom of the iPhone to the right of the Lightning port and at the top of the iPhone to the right of the FaceTime camera. These stereo speakers allow you to place your iPhone 8 on its side and play your favorite songs while you’re at the beach, park, or just relaxing at home. One of my favorite iPhone 8 features is Touch ID, which you can use to unlock your iPhone, confirm purchases, and so much more. This iPhone’s Home button has a built-in sensor that can detect your exact fingerprints! The iPhone 8 was the first model iPhone to be built with an A11 chip, the most powerful ever used in an iPhone. The A11 chip is equipped with a three-core GPU (graphics processing unit), which is 30% faster than the GPU of the A10 fusion chip used in the iPhone 7 and iPhone 7 Plus. The efficiency cores of the A11 chip are also 70% faster than those of the A10 chip, which is used in the iPhone 7 and iPhone 7 Plus. The iPhone 8 has an incredibly long-lasting battery. You can enjoy up to 12 hours of internet use, up to 13 hours of video playback, up to 14 hours of wireless talk time, or up to 40 hours of audio playback. The iPhone 8 is also one of the first iPhones to support “fast-charging”, as its battery can be charged up to 50% in as little as 30 minutes. Just like the iPhone X, the iPhone 8 has a water and dust-resistance rating of IP67. This means that the iPhone 8 will be water-resistant when submerged up to 1 meter (about 3 feet) in water. The 6 in IP67 indicates that the iPhone 8 is completely dust-resistant as well. The iPhone 8 can be charged wireless on a Qi charging pad. The largest model of the iPhone 8 has twice as much storage (256 GB) as the largest model of the iPhone 7. The new faster processor in the iPhone 8 is the same processor used in the iPhone X. This lightweight phone weighs less than a third of a pound. The iPhone 8 and 8 Plus were the first iPhones to have a True Tone display. Unlike earlier models of the iPhone, the iPhone 8 has a completely glass back.